At Elliot Whittier, we are your local independent insurance a gents with offices in Winthrop and Danvers, MA. Being an independent Massachusetts insurance agent means that means we have multiple insurance companies we can quote from, not just One Big One! We pride ourselves on our ability to find you the most appropriate coverage at the best rates for your motorcycle. 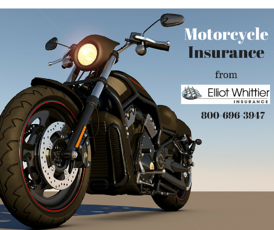 Combine your motorcycle insurance with your home, renters or condo insurance at Elliot Whittier, for even MORE discounting. Is your motorcycle properly insured? Check out our blog on Motorcycle Insurance here. If you would like to learn more about properly insuring your motorcycle or obtaining a quote for your motorcycle you can call us at 800-696-3947 or contact us 24/7 by clicking on the button below and we will get right back to you. With offices in Danvers & Winthrop Massachusetts, Elliot Whittier Insurance has been awarded the Five Star Award of Distinction from the Massachusetts Association of Insurance Agents. Elliot Whittier Insurance is also a Trusted Choice® Agency and represents multiple insurance companies, so it offers you a variety of personal and business coverage choices and can customize an insurance plan to meet your specialized needs. You can visit Elliot Whittier Insurance online at www.elliotwhittier.com or email info@elliotwhittier.com or call 800-696-3947.